Welcome back. A few years ago, I rolled up my sleeve and got my annual flu shot while visiting my doctor, who practices in a hospital. The bill was sent to and paid by my health insurance company, which sent me the explanation of benefits. I suppose I shouldn’t have been surprised. The hospital’s administrative cost for the shot was more, way more, than the cost of the shot itself. That was the first and last time I got my flu shot there. I haven’t blogged about health care costs in months. My last protest post was also about hospital charges (Emergency Room Overcharges): Johns Hopkins University researchers found emergency department charges were not only higher for the same, non-emergency services but that uninsured patients were often billed the inflated chargemaster prices. I’m back on the topic because I thought you might be interested in a study by researchers from Harvard and the London School of Economics and Political Science. They dug into why health care spending in the U.S. is so much greater than in other high-income countries even though many health outcomes in the U.S. are worse. The researchers analyzed data primarily from 2013 to 2016 from key international organizations or country-specific sources. They compared structural features, types of health care, social spending and performance between the U.S. and ten high-income countries--United Kingdom, Canada, Germany, Australia, Japan, Sweden, France, Denmark, Netherlands and Switzerland. - The U.S. spent over 5% more of its gross domestic product on health care than any of the other countries. 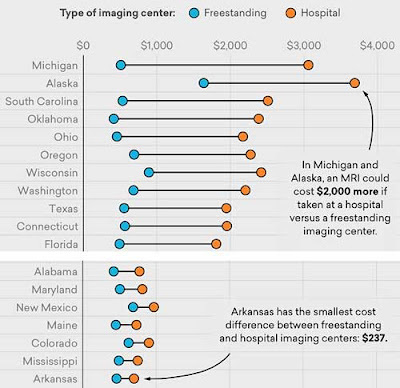 - Administrative costs related to planning, regulating and managing health systems and services were at least 5% higher in the U.S., and pharmaceutical costs were about $500 to nearly $1000 higher per person. - Salaries of physicians and nurses were higher in the U.S.; for example, annual salaries of generalist physicians were about $64,000 to $132,000 higher. 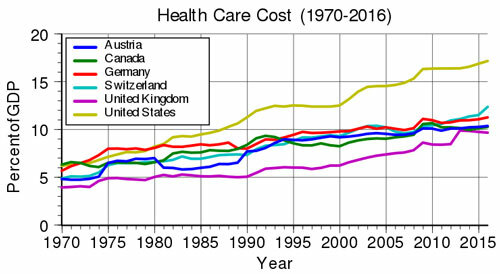 - While 10% of the U.S. population lacked health insurance, everyone or nearly everyone (99% to 100%) in the other countries was covered; the US had the highest proportion of private health insurance. - The U.S. had the highest percentage of overweight or obese adults, the lowest life expectancy and highest infant mortality. - The physician and nursing workforce of the U.S. was similar to that of the other countries, as were the number of hospital beds and utilization rates measured for acute myocardial infarction, pneumonia, chronic obstructive pulmonary disease, hip replacement, knee replacement and coronary artery bypass graft surgery. - The U.S. had higher utilization of magnetic resonance imaging (MRI) and computed tomography (CT or CAT scans). - The ability to get a same or next day appointment with a physician was better in the U.S. than in most of the other countries but not by much. Although there’s wide disparity in spending among U.S. states and regions, overall, the U.S. is not winning any prizes. Why are we spending roughly double what other high-income countries spend for comparable utilization rates and worse outcomes? The researchers conclude quite simply that it boils down to cost. Administrative costs and the cost of labor and goods, including pharmaceuticals, appear to be the major drivers of the difference between the U.S. and other high-income countries. Can any of those costs be reduced? 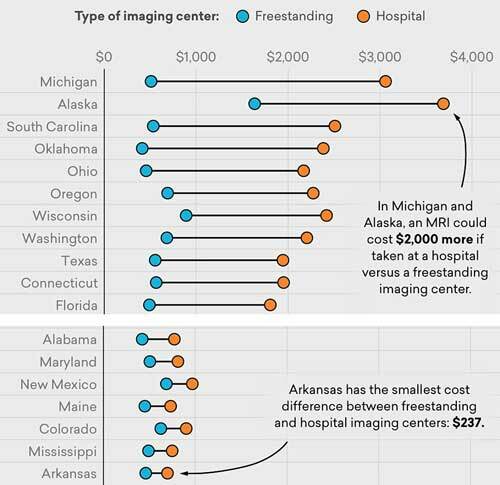 How about cutting back on MRIs and CAT scans or, at least, exercising some cost control? They vary so much in price within and among states. At least I have insurance. Thanks for stopping by.